Here is another good example of the kinds of post production image editing that we do for some dance photography. 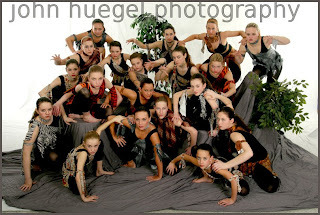 The “Before” is a staged pose with about 18 dancers. Other than white background and grey foreground and some hidden stools, this is a pretty tame shot. I surfed and purchased a great shot of an African sunrise from dreamstime.com. This site has wonderful stock photography for reasonable prices. 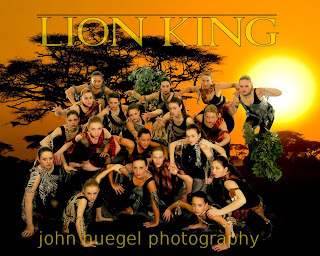 Then I cut away most of the background and put the image of the dancers on the front of the sunrise image. I then colored their skin to have the same glow that you would see during a sunrise. A bit of titling and the piece is done! I’m pretty happy with this one. Working with the constraints of space, time and props, we took a pose and made it thematic. The studio is very happy with this image!